Author(s): Claudia R. Batista de Souza, Instituto de Ciencias Biologicas, Universidade Federal do Para, Guama, Belem, PA, 66075-110, Brazil. Savio P. dos Reis, Luiz J. Castelo Branco Carvalho. Cassava (Manihot esculenta Crantz) belongs to the Euphorbiaceae family and is originated from the Southern Amazon basin. The storage root is the most important product of cassava as food for more than 800 million people in Africa, Asia and Latin America. In this review, we present a retrospective of studies aiming the identification of cassava proteins, starting from the first investigations using SDS-PAGE and classical two-dimensional gel electrophoresis (2DE) to recent studies with advanced technologies such as high-resolution 2DE, mass spectrometry, and iTRAQ-based analysis that have contributed for characterization of cassava proteome. Several cassava proteins have been identified, including those involved in the storage root formation and post-harvest physiological deterioration processes. Keywords: Cassava, mass spectrometry, post-harvest physiological deterioration, proteomics, storage root formation, uni- and bi-dimensional gel electrophoresis. Affiliation:Instituto de Ciencias Biologicas, Universidade Federal do Para, Guama, Belem, PA, 66075-110, Brazil. Keywords:Cassava, mass spectrometry, post-harvest physiological deterioration, proteomics, storage root formation, uni- and bi-dimensional gel electrophoresis. Abstract:Cassava (Manihot esculenta Crantz) belongs to the Euphorbiaceae family and is originated from the Southern Amazon basin. The storage root is the most important product of cassava as food for more than 800 million people in Africa, Asia and Latin America. 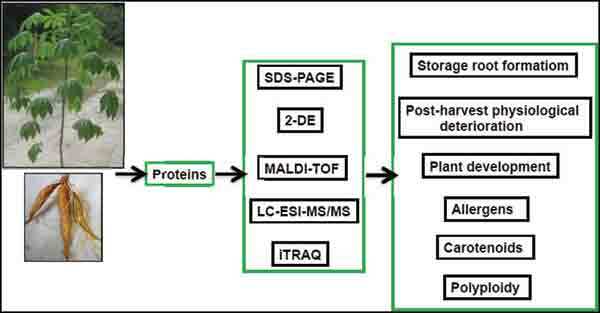 In this review, we present a retrospective of studies aiming the identification of cassava proteins, starting from the first investigations using SDS-PAGE and classical two-dimensional gel electrophoresis (2DE) to recent studies with advanced technologies such as high-resolution 2DE, mass spectrometry, and iTRAQ-based analysis that have contributed for characterization of cassava proteome. Several cassava proteins have been identified, including those involved in the storage root formation and post-harvest physiological deterioration processes.